Question: In order to save time, I want to have a look at the calendar with one or two clicks. Hoe can I do this? Answer: There are two ways in which you can do with Windows Vista. 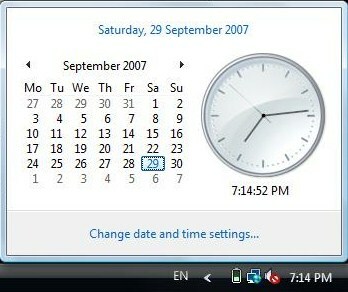 Method 1 – Just click on the time figure located at the right side of the Task bar. This is the best option. Method 2 – Place a calender widget on your Vista sidebar. (To see how to add a widget, click HERE) To quickly view the sidebar just click on the sidebar icon in the Current running program icons. See picture below. Entry filed under: Desktop, Tune up, Vista, Windows.